This particular line is fits for Hemlata Mirre, an alumnus of Don Bosco Tech (Raipur), when she asserts herself to be self-made. She belongs to Taulidih, a far-off village of Bilaigarh Block, in Baloda Bazar District, Chhattisgarh. In a family of four siblings (two brothers and two sisters) having no parents to support after they passed away in her young age, anyone could imagine the plight of the family. Caught up in complex situation, she stayed partly with her elder brother and then with her elder sister. Though in demoralizing circumstances a craving for dignified life kept her search for opportunity alive. A ray of hope peeped into her life when the mobilizer met her during mobilization and explained about the program of Don Bobco Tech. She was keen to know and understand in detail regarding the training course and therefore she visited Raipur Centre. After consultation with the counselor, she was convince to join the training program and chose Sales Associate domain. Initially she had lot of inhibition however the progress was very significant by the end of the training program. She was selected in her first attempt of interview and joined Raipur Central with Rs 11800 /- per month. She is extremely happy with the growth in her career. 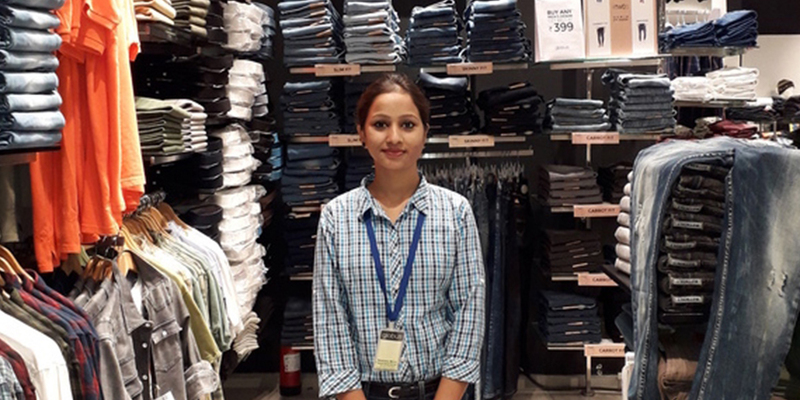 After few months, she selected to join in Globus as Sales Executive. Now she earns Rs 13500/- per month. “Financial freedom has given me lot of confidence and a dignified life. I am thankful to Don Bosco Tech for bringing transformation in my life,” says Hemlata Mirre.